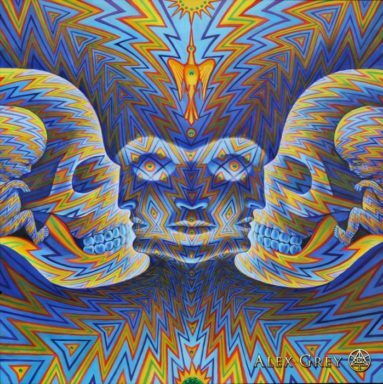 Artist, author, teacher and public figure, Alex Grey, has led a revolution in the world of visionary art. He studied human anatomy at the Harvard Medical School, giving him a great knowledge of physical form. Also studying mind and body medicine at Harvard, his combined knowledge of anatomy, healing, and psychedelic drugs evolved his art into a philosophy. Deeply permeated in the transformational festival culture, Alex and his wife Allyson have become the voices and artists of a generation. In this interview, we discover, learn and transcend. Morena: On May 15, 2001, I purchased Tool’s Lateralus. It was this day that I first submerged my mind into your world. 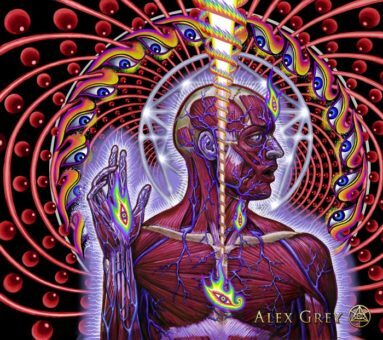 How did your artwork find its way onto the Lateralus album? Alex Grey: At my art exhibition in Los Angeles, 1999, I met Adam Jones, Tool’s lead guitar and visual creative director. Later, he approached me with an anatomically based concept for the Lateralus CD cover. Adam is not only one of the world’s great rock musicians, he is a unique, surreal graphic artist whose drawings of mutant humans are both frightening and hilarious. In addition, Adam is a filmmaker who directs and designs music videos for Tool, recreating bizarre dreams. I became a big fan of Tool’s intense music. I created the CD insert booklet, as well as the cover. The response was great. Then, Adam invited me to offer a one-minute transformative conclusion to his epic, surreal music video for the song, “Parabol/Parabola.” My imagination was stretched in new ways preparing storyboards and collaborating with talented animators. Then, Adam asked me to design the stage set for their Summer/Fall tour in 2002. I suggested numerous of my existing images for backdrops and banners as well as their line of apparel. It was thrilling to see my art integrated at a stunning scale into the concert spectacle. The giant screen projections, unfurling banners and hallucinogenically lit artwork reinforced the message in the music. The art and almost ten minutes of animation associated with Tool’s 10,000 Days album was even more intense collaborative work. There may be more to come. For introducing my work to millions of people, I am eternally grateful to Tool. Now, thousands wear flaming eyes tattooed in every conceivable place on the body! Morena: Amazing, I saw Tool on that tour! Live painting at shows and festivals, music seems to be a huge part of experiencing your art. Who are some musical artists that have evoked inspiration through your tympanic membranes? 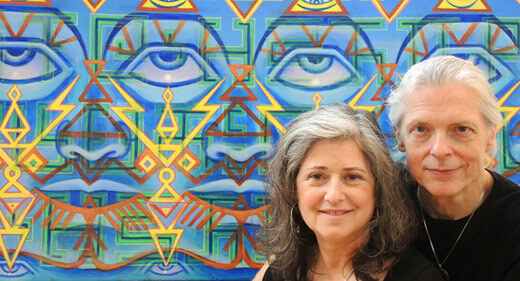 Alex: Live painting alongside the artist, Allyson Grey, my beloved partner for 40 years, we have enjoyed cutting-edge electronic and live music on practically all continents. The electronic and contemporary music scene has gotten deep and incredibly diverse. We’ve had the good fortune to paint onstage next to Shpongle, Tipper, Ott, Beats Antique, SCI and dozens of truly awesome young musicians who continually expand into new sonic territory. Our favorites include sounds from many cultures and eras, a variety of music that is ever expanding. Ecstasy comes in many flavors. We love the classics. Beethoven is one of our greatest inspirations. Bach, Schubert, Nusrat Fateh Ali Khan, Jelly Roll Morton, Fats Waller organ works, The Beatles, Jimi Hendrix, Pink Floyd, Led Zeppelin, Etta James, Dixie Chicks, Sheila Chandra, Old Time Fiddlers of Prince Edward Island, Klezmatics, Moby, Beck, Philip Glass, Jib Kidder and did I mention Tool! Morena: What is your favorite color and animal right now? Morena: You are very open about the use of entheogenic drugs and their great influence on your work as well as your perspectives. Do you still use these drugs or just draw upon past experiences with them? Alex: Allyson and I continue to have a respectful relationship with sacraments. If I never journeyed again, we’ve already had the most awesome ride of the cosmos with eons of inspiration, notated in sketchbooks from past trips. Our preference is to journey a few times a year in a peaceful supportive setting, to get a full dose of God’s infinite love as we stare into the sacred mirror and gorgeous eyes of the beloved other. If love is an addiction, then psychedelics may be the gateway drug. Sacraments should receive a unique classification among substances. They are at the foundations of both Eastern Hinduism and Western Greek civilizations, yet sadly, for the past 2,000 years, our Western religions have attempted to suppress and wipe out all knowledge and use of these miraculous visionary plants and molecules. Sacraments are resurfacing now because humanity needs to wake up to the divinity of nature before we self-destruct. In 1955, Maria Sabina, a Mexican shaman, revealed a sacred secret to Western scholars. In a dream, Jesus Christ asked her to share the magic mushroom, now known as psilocybin, to help save the environment. The higher spiritual dimensions are helping humanity evolve toward a planetary civilization. Sacraments such as peyote, psilocybin mushrooms, ayahuasca and cannabis, are shamanic vision plants, not drugs in a profane sense. 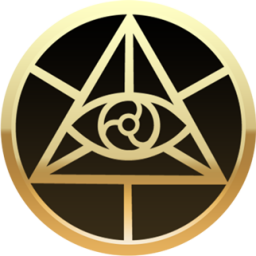 Used with respect and care, they provide open portals to the Mystical Visionary Experience, as proven through scientific research. Roland Griffith’s John Hopkins studies on psilocybin, published in premier medical science journal Psychopharmacology, confirm this as fact. In repeated trials over fifty years, studies showed that 65% of spiritually inspired people who take a single dose of psilocybin with a prepared mind set and a supportive setting, report having had a mystical experience. Allyson and I and many others reported this decades ago. I believe these sacraments, neither toxic nor addictive, are helping people around the world to recognize the holiness of life and revere the earth. People always have and always will. Sacraments, misclassified by President Nixon as “Schedule 1 Drugs with no proven medical use,” actually have been proven repeatedly to have great medical usefulness. These sacred substance potentiate a free mind and attract God contact to those receptive. Nixon’s own medical advisors recommended legalizing cannabis. Documented conversations reveal Nixon’s personal vendetta against psychedelic advocate, Dr. Timothy Leary, calling him public enemy #1. Nixon’s unholy Class War, a charade he called “The War on Drugs,” is unacceptable on every level and must be undone with haste. Nixon resigned in disgrace before impeachment because of his dirty tricks. Weigh the staggering cost in lives and suffering, not to mention the wasted human and financial resources resulting from this unwinnable Drug War. Compassionate, intelligent people need to “come-out” and be a stand for ending the drug war today.